R.Krishnaswamy, of Narada Gana Sabha, in his introductory speech before awarding him the title “Harikatha Ratna”, said how TNS has mastered the core essentials of performing Harikatha successfully, which is no ordinary feat as the exponent must be armed with mastery of music, narration and knowledge supported by good memory and above all eloquence. He quoted the sloka `vasthrena vapushaa vaachaa vidhyayaa vinyena cha,' the five vakaaras needed for success, namely, a person who is well-dressed, has a good personality, is eloquent, knowledgeable and modest and said that all were present in TNS making him a true harikatha vidwan. 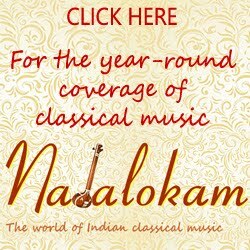 Madurai TNS , is a well known vainika gayaka who took the leap in 2003 to make his major professional entry into formal Harikatha along with singing and veena playing. TNS, did his Harikatha on the topic “Tyagaraja Charitram”, which he presented as a story of Tyagaraja’s musical journey. How the Saint travelled his life through his music towards Lord Rama made the central theme of his charitram. were some of the remarkable features of the Katha. 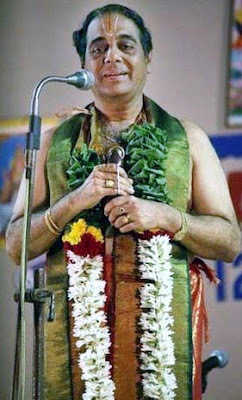 To demonstrate how the “Ushi” tala is used in Harikatha, he presented the song Kanukontini in Bilahari and sang a few swaras to demonstrate the tala. Talking about the subject of talent in music, Tyagraja has said that it is the blessing of God and cannot be handed over from father to son as a heirloom. Singing the passage “sangeethajnaanamu dhaatha vraayavaleraa” from Seetaavara in Devagandhari , he said that if one should have sangeethajnana the creator should pre ordain it at birth. In his krthi Svararagasudha in Sankarabharanam, Tyagaraja says, what is the use of a frog and a stork sitting on the lotus when it cannot enjoy the joy of the honey , unlike a bee which comes from afar to enjoy this infinite joy. He talked about Tyagaraja’s presentation of Lakshana Lakshya of music through Kadanuvariki in Todi, wherein he explained the meaning of the charanam -niddhuraaniraakarinchi, muddhugaathambooraabhatti and Suddhamaina manasuche, the last one being most important, for producing good music. An interesting musical perspective was provided by him about Charukesi as a raga for Ada modi galade. In this song, Tyagarja, tells Rama that when He did not speak to the sarvagnaa, nava vyaakarana pandita like Hanuman and let Lakshmana only speak to him, why would He speak to the poor Tyagaraja. The appropriateness of the raga Charukesi, TNS defined thus : In the aaroha of Charukesi , S,R,G,M,P ascends like Sankharabharnam and the rest of the notes D, N,S are the Hanumathodi swaras. Since this song is about the Raama Hanuman sambhaashana, he used a raga which incorporates from Shankarabharana and Hanumathodi , as Hanuman is Siva’s amsa. TNS made Tyagaraja come alive for two hours treating the rasikas with his eloquence, music, wit and expression, packed with information and spiced with wonderful music and quotations. Sita Kalyanam, Meenakshi Vaibhavam and Srinivasa Kalyanam. 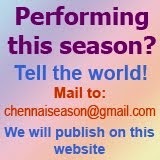 This year he is slated to perform Nandanar Charitram during the December Season at the Tamizh Isai Sangam on the 1st of January, 2010.
well written, covering all the aspects of the HK well.